Today we’re seeing a shift from large data centers to multiple smaller data centers as well as the shift to using private clouds, and public clouds. In fact, at Cisco we’re seeing that over 50% of our customers are using public cloud options. Most customers aren’t all in on the public cloud concept for various reasons, though, whether that’s security, privacy, or price. For that reason hybrid cloud architectures are gaining popularity. We’re also seeing that companies are using more applications than ever before. And even more than that, they’re rapidly versioning these applications. Developers no longer want to create applications based on the infrastructure, which can be very cumbersome and doesn’t lend itself to deploying applications consistently whether they’re using on-prem or off-prem clouds. Given these circumstances the question is no longer whether companies are going to put their applications in a cloud, it’s: How do we deploy, manage, and even migrate these applications regardless of where they reside? This is why we need a new type of cloud management solution. This is what Cisco Cloud Center will allow you to do. You can profile new and existing applications whether they’re made up of traditional VMs, PaaS services, containers, or some combination thereof. Once you’ve created these profiles, they can be deployed across any data center, private cloud, or public cloud in the same way. With Cloud Center you’ll have the ability to model, benchmark, deploy, and then manage these applications in a more scalable way, both technologically and administratively. 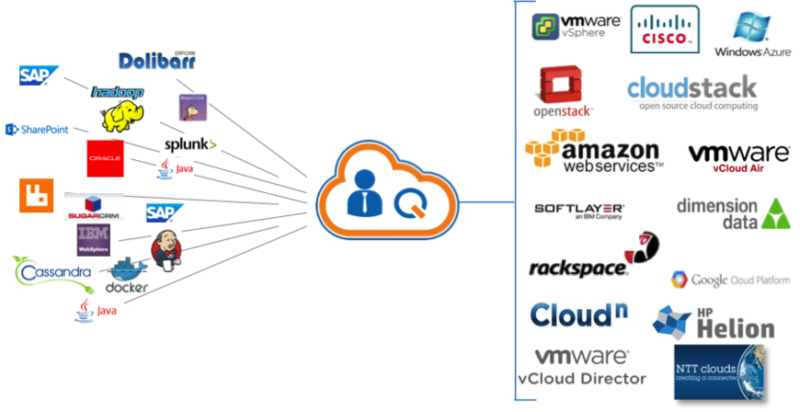 Cloud Center is actually made up of a few different components which can be deployed in your environment as VMs. The first main component is the Cloud Center Manager, which provides the GUI where you can specify policy, governance, tenancy, etc. The second main component is the Cloud Center Orchestrator which is actually the patented technology that allows us to take the intent specified from the Manager and deploy that to the target, which could be ACI, VMware, OpenStack, AWS etc. The orchestrators actually run in the region in which they’re being used. So if I’m deploying an app to my datacenter, it will reside as a VM in my data center, if I’m deploying an app to AWS, it will reside in the proper region of AWS. The orchestrator will use the capabilities of each cloud as well, meaning it’s not dumbing down a profile to fit the most general use case. So, for example, because ACI uses multi-tenancy, that can be built into an application that’s being deployed to an ACI data center. That same application can be deployed to a data center that doesn’t have multi-tenancy built in, then the application won’t have multi-tenancy capabilities in that data center. Let’s talk a little bit more about the model based approach in Cloud Center. In the traditional way of creating applications for multiple targets or cloud regions we would likely use a script-based approach. We have an application at the top, maybe we’re working with SAP Hana, and a different application model has to be created depending on where we’re deploying the app. In that case we also have to maintain these parallel tracks for each cloud solution we work with. A better way to do this is to use Cloud Center because it already knows how the targets work, whether that be your ACI environment or AWS or Azure. Cloud Center will talk to these targets for you, so you only need to profile the application one time and you can deploy it anywhere. While it’s important for the IT and Dev teams to be able to deploy applications to multiple clouds, we also need to keep in mind that everything changes. So even if you’re only using one cloud, it’s possible that cloud could go away. Take for example HP Helion, which is no longer running as a public cloud. With Cisco Cloud Center, that’s not an issue. The application can easily be migrated to a different cloud or brought back in house. If you’re doing this in a more traditional way, though, likely your developers and infrastructure people would have had to train on the new target, learn the APIs, etc, and develop a whole new strategy of deployment and likely it wouldn’t just be for one application. Cloud Center with direct integration into UCS Director, ServiceNow, and ACI gives us the full package. We’re not only able to easily deploy new applications, but we can provide a full ITSM suite. Cloud Center also uses the idea of the application profile, very similarly to how ACI defines it. We could have a web, app, and DB tiers, along with services tiers, and any other tier necessary within the application. Since both CliQr and ACI use app profiles as well as a declarative model, it’s a natural fit. In the case of ACI, CliQr will create end point groups within ACI, along with contracts, and as we already know ACI will automatically create those EPGs (in the case of VMware these would be PortGroups) in our virtual environments. Then, instead of having to go into vSphere or some other virtual management solution to provision VMs, Cloud Center will manage this as well, and place those VMs in the proper PortGroups. It’s literally a one—stop self service portal for deploying applications. Enough talk…on to the video demos.